This guide aims to give you a view of what the process looks like to set up an Email Sending domain on HubSpot through a major registrar. In this case, I am using the domain name registrar, Hover.com. 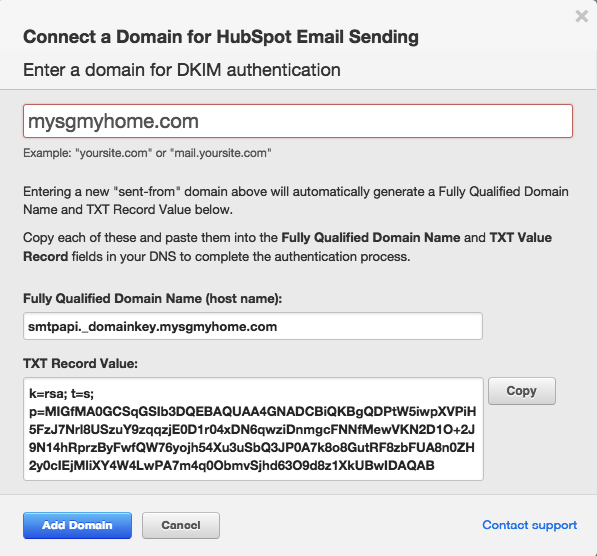 This aims to supplement the steps on “How to set up your email sending domains” on HubSpot’s Academy Knowledge base to set up your Email Sending domain. Again, this guide below aims to give you more insight into how this can look on a domain name registrar’s portal. Click on the blue button within this section to “Connect Another Email Sending Domain”. Type in your domain, and your host name will automatically be filled, so then you’ll want to copy the TXT record value that appears below so that you can paste it into the relevant area within your DNS records. Then click Add Domain. Copy and paste the TXT Record details and put into your domain name registrar DNS settings. Click “Save” afterwards. You’ll want to type in smtpapi._domainkey.mywebsite.com for the Host (from “Fully Qualified Domain” as seen above), and then paste the TXT record into the TXT Value. Take a look below to get an idea of what this looks like in your Domain Registrar. This is the view from Hover.com. Check in HubSpot’s “Domain Manager” that it is working. You should see a green icon next to the domain name you have set. Here are the instructions again to get to your Domain Manager if you’re looking for it.